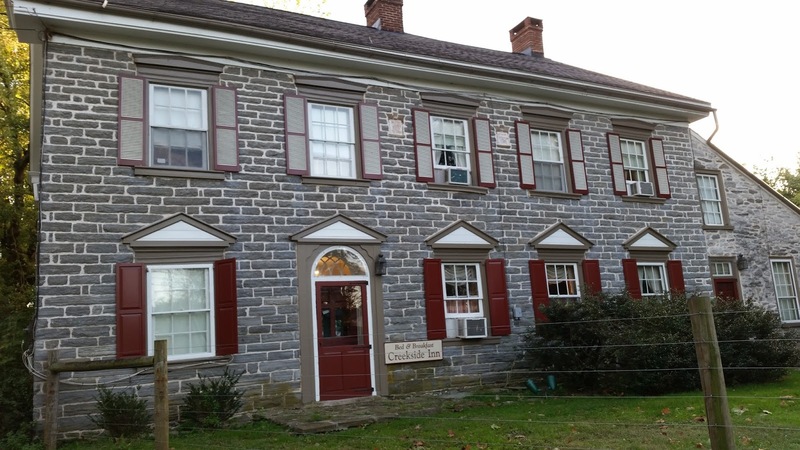 We checked into the cozy Creekside Inn for a change of scenery and a nice two-day getaway to celebrate our anniversary.The old stone house, which dates back to 1781, is situated near a creek along a road that leads from Paradise to Gordonville, Pennsylvania. My husband selected our digs several weeks ago. The spacious three-room suite called “The Creekside,” featured a bedroom with an impressive floor-to-ceiling stone fireplace operable in winter. A private bathroom was located off the bedroom and a spacious, comfy sitting room featured a couch, chair, desk and big-screen TV. Fireplace in our room at the Creekside. Sitting room at the Creekside. Although we were on a strict schedule, we did find some time to relax in the homey, carpeted sitting room and the bed in the adjacent room seemed custom made for a great night’s sleep, especially this time of year. Adding to the quaint two-day stay was the clip clop of the horses outside as they made their way down the road. The horses passed often throughout the day and night. Only once was I awakened out of a deep sleep, on a Monday morning at 2 a.m. by teens hooting and hollering, which I found amusing. I was later informed that Sunday night is “date night” in the Amish community. During our visit, the inn was full, with all six rooms rented out to guests from Boston, Delaware and Maryland, which whom we had the pleasure of conversing with each morning during the 8:30 breakfast hour. Our hosts, Cathy and Dennis Zimmerman, were quite hospitable from beginning to end, with Dennis helping my husband with our bags and Kathy toiling in the kitchen to craft magnificent breakfasts featuring eggs, sausage, apricot bread, juice, coffee and tea one morning, and a delicious, moist apple bread paired with blueberry French toast, bacon, homemade English muffins and the same drink offerings on morning two. Each day, we found homemade pastries in our room, half of which I had to decline to adhere to at least a semblance of a diet. I can just taste them now. No wonder the Inn received a “Certificate of Excellence” from Tripadvisor. The Zimmermans pay homage to the original homeowners and commissioned a painting of David Witmer, Sr. and his wife Esther Kendig, who oversee operations in the dining room where guests enjoy breakfast. Two stone tablets in the wall of the house read “Bilt by David & Esther Witmer in the year of our lord 1781." Witmer, according to the Zimmmermans, purchased the land from Jacob Fierre, son of Philip and Mary Warenbuer Fierre and was part of the original tract granted to Mary Fierre by William Penn. Skilled in farming, milling and bridge and road construction, Witmer likely met many influential people and added to that circle of influence when he became engaged politics and community service. Witmer and George Washington became personal friends and according to records held by Witmer’s descendants, David traveled to Philadelphia to meet Washington as he was en route to New York for the inauguration in 1789. Several years later, Washington was said to have paid a visit to the area, visiting a mill to study hemp processing. 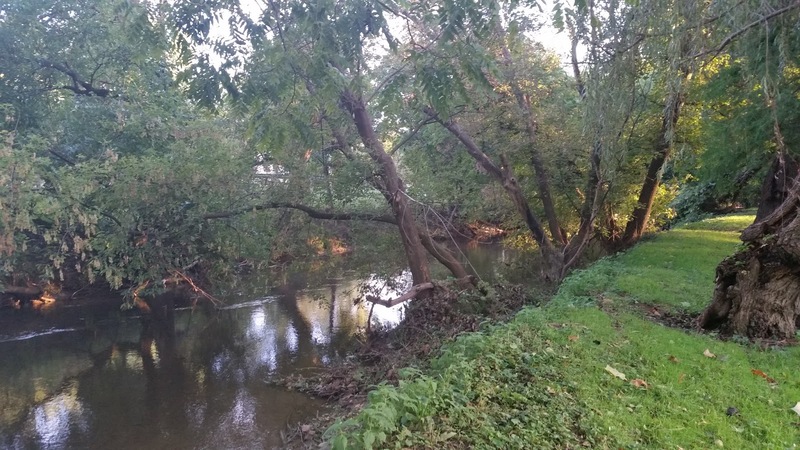 During our visit, we took the time to explore the property, traversing the nearby concrete bridge and onto the property that abuts Pequea creek. Despite it being the first week of October, everything was still green and lush. We considered ourselves lucky as a tornado was said to have touched down in the area just a few days before and a huge tree across the street was being chopped into manageable pieces and hauled away the day we arrived. A stroll along the creek.